I used the digi Fall Birgitta and a sketch from Cute Card Thursday. The buttons are from Papertrey and the sentiment is from Stampin' Up! Pile It On - "Girls just wanna have fun"
I used Fancy Phrases from Waltzingmouse Stamps and sketches from Waltzingmouse (the tag portion) and Unscripted (the background portion). The papers are from the Echo Park Victoria Gardens 6x6 paper pad and the felt rose was made using the smaller of the Mini Rolled Roses dies. This card is also for Pixie Dust Studio - add a tag or create a tag, and Creative Card Crew - handmade flowers. I hope you like it and TFL! I used Cupcake Leslie and a sketch from Sketchy Thursday. The papers are from the Happy Go Lucky 6x6 paper pad from My Mind's Eye, the twine is from Timeless Twine and the rub-on is from Stampin' Up! 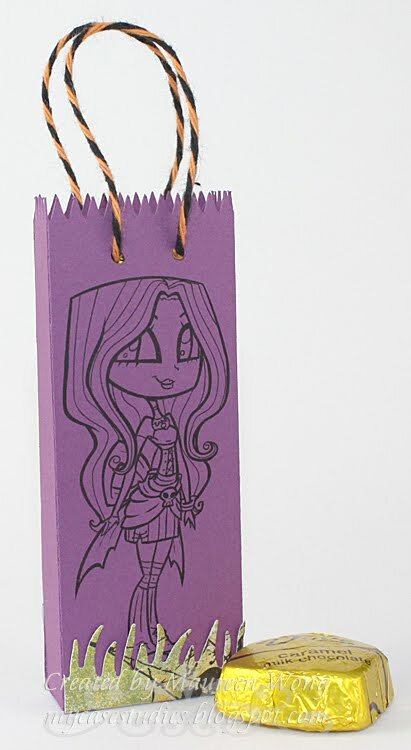 My Time to Craft - "Here Come the Girls"
Totally Gorjuss - "As you like it"
I already had a bag template that I designed in Make the Cut from this project, so I just made it really tall and skinny to perfectly fit the 3 chocolates. 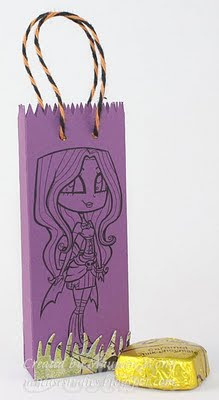 I sized down digi Betty so she would also fit on the little bag and printed her on both sides after it was cut out. The final touches are some die cut grass and Halloween Timeless Twine. This is also for Dutch Dare - Anything but a card. Hope you like it and TFL! HIP, HIP, HOORAY, Marci and Luka had a BIRTHDAY! On August 1st Marci and Luka finally turned ONE and we're having a blog hop to celebrate! Even though I'm no longer on the LLLC DT, I (along with other alumni and friends) was invited back to join in the celebration! If you came from Leanne's blog, then you're on the right track. However, if you just came across my blog, you'll want to start at Becca's blog because all this awesome eye candy is not to be missed! To be eligible for this FABULOUS blog prize, you must follow 3 easy rules that are explained on the La-La Land Crafts Blog. You have until August 31st to enter and the winner’s name will be drawn on September 3rd. This is a 5" tall clear pail that I got from my local craft store. I used Make the Cut to design a divider for the pail and even printed the sentiments through MTC! In case you can't quite see it, the bottom says "It's y-arrr birthday!" I watercolored Marci with just brown Tombow markers then cut her out and popped her up with foam boosters. I inked and crumpled the divider before I stuck her on to look like something old (like a treasure map). The top says "Enjoy your booty!" I filled this section with some chocolate coins and some cash with iridescent filler. I hope you liked my project and thanks for hopping along with us! Your next stop is the incredibly talented Pops. I used Send Me a Sign Bugg (one of my faves!) and the Cosmo Cricket Social Club Mini Deck. I designed the little box and the cutting file for the Bugg in Make The Cut and printed the Bugg onto the cut out through MTC. Finally, I also printed the scraps for the paper piecing and added the text to the sign using MTC. The box is just under 1.5" wide, 1.25" tall and 1.25" deep and holds 3 Dove chocolates. Hi everybody! I finally have a couple projects today with some stamping on them (but just a very little)! I used her Bella Rose Backgrounds (background and butterfly layers) and Floral Postcards (label layer under butterfly) digital collages, a sketch from Card Positioning Systems and the sentiment stamped on the twill is from the Elegant Greetings set from Your Next Stamp. The butterfly and label dies are from Spellbinders, the pearls are all from the Mimi Lo Lo Etsy shop, and the twine is from Timeless Twine. I tea dyed it just a bit to make the white strands a little less stark white. Fab 'n' Funky - "A Stitch in Time"
I used the sketch from Waltzingmouse, Very Vintage Labels No. 4 and Fancy Phrases. The 2 background papers on the tag are from her Shabby Backgrounds and the little bit on the heart chipboard is from Bella Rose Backgrounds. Again, I used a little Timeless Twine, also tea dyed. I know they're nowhere near the beautiful creations that Bety makes, but I'm happy with both and I hope you like them too! TFL! I have a couple of Timeless Twine projects to share with you today (sorry - no stamping!). For both projects, I designed them using Make the Cut and cut with my Cricut E (only in use until I get my Zing!). The spool is from the Seamstress Cut It Simple Shapes set from Lettering Delights. I created a little card and also an extra spool to wrap the twine around, then glued the extra spool to the front of the card. The hanging loop is attached to the back panel of the card. I used Pumpkin Orange and White Timeless Twine. Just like the tag, I created a base layer and also cut an extra spool to wrap the Kraft twine around. I also tied a bit of the twine around the twill bow to bring it all together. I hope you like them and another big thanks to Stacy for this fabulous twine!! 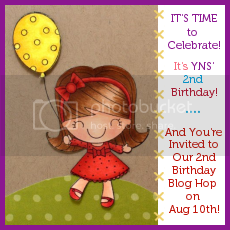 Hey everyone and welcome to YNS' 2nd Birthday Blog Hop - we are so happy you are here celebrating with us and our wonderful guest designers! 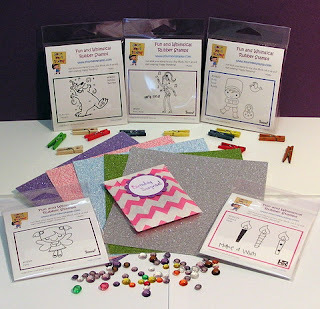 If you have been hopping along and are arriving from Diana's blog then you are right on track! But if you just happened across my blog and want to join in all the fun and games, then you can go to the start at Peggy's blog. Not everyone has a puzzle piece so you need to pay attention, and click on the puzzle pieces, and follow the directions as you find them along the way (3rd party cookies must be enabled to do the puzzle). 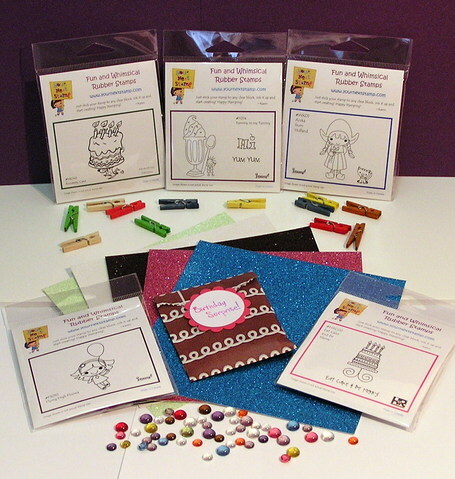 When you are done put them all together at the end of the hop for your chance to win! You have until Monday, August 15th, at Midnight EST. I used the August Sketch For You To Try and some adorable papers from the My Mind's Eye Life of the Party 6x6 paper pad. The image was stamped and colored with Copics, then I added an extra popped up spoon, clear dimensional adhesive all over the glass, and custom dyed bugle beads for the chocolate sprinkles (I just put them on a little disposable plate and dripped brown Copic reinker on them). The sentiment is cut from one of the papers in the pad. You can see that the candle flames' "halos" are attached to the front and back layers so they pop out when you open the card! I used the Make A Wish set (one of my fave YNS sets! 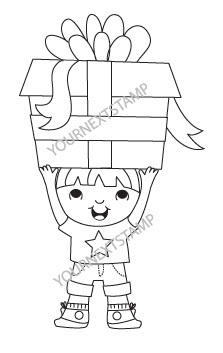 ), Eat Cake and Be Merry (inside sentiment), the MME True Blue 6x6 paper pad and Make the Cut. I can't take all the credit though - the idea came from an old book I was looking through called "Making Great Handmade Cards" from Hot Off the Press. The card in the book had hand-cut layers and I knew I could do it more easily with MTC and my Cricut! The whole card is cut through MTC except for the individual candles. For those, I stamped the flames on white and colored with Copics, then paper pieced the bottoms. Even the sentiment banners were cut through MTC! Finally, I finished the card off with some pumpkin orange and white Timeless Twine. Can you believe that YNS is turning 2?! We're going to celebrate on August 10th and would like as many of you to join us as possible! Our talented DT member Jenny made this adorable birthday badge for us to post on our blogs so we're asking you to please grab this badge and post it on your blog plus tell all your friends to do the same! TFL and I hope to see you all back for our big 2nd Birthday Celebration! I designed the whole thing in Make the Cut and cut with my Cricut (in use only until I get my KNK Zing - I can't wait!!!). For the bat, I used Lettering Delights' DB Boo Ya and the sentiment was done with LD Little Piggy. I used basically the same design as the candy pail, but this time I also cut out the letters from the black layer so the light would show through them. I glued a piece of orange vellum to the back of the black layer so you can't see the actual tealight candle through the bat cutout. To finish it off, I glued twine all around the metal handle. BTW, if you haven't already "liked" the Timeless Twine Facebook page, go ahead and do it now - ‎if Timeless Twine reaches 300 Page likes they will be giving away 3 Spools of Classic Timeless Twine colors! For extra entries, be sure to share and refer your friends and have them mention that you sent them. I hope you like my projects and TFL!